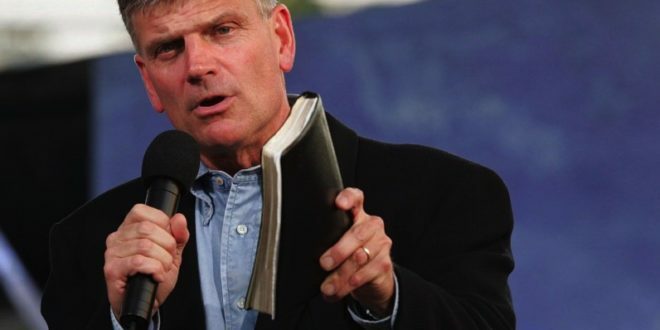 I have long respected Franklin Graham and his stance here saddens me a great deal. He claims that Trump has apologized for what he said on that tape and he should be forgiven. Sorry… forgiveness is for God to decide, not us and frankly, Trump never really apologized and he certainly doesn’t mean it. Then Franklin said this election is all about the Supreme Court. Normally, I would agree, but this time, I certainly don’t. Let me explain… it should be about the Supreme Court and our constitutional rights. But nothing Donald Trump has shown me indicates that he will indeed nominate conservative justices. Quite the opposite. He has spoken about nominating his sister who is a liberal and other Leftists as well. He uses a conservative list given him and then asks everyone to trust him. A man who has changed his stances so many times, it would be a virtual impossibility to keep his word. A lot of people are slamming evangelicals for supposedly giving Donald J. Trump a pass. That’s simply not true. No one is giving him a pass. I’m certainly not, and I’ve not met an evangelical yet who condones his language or inexcusable behavior from over a decade ago. However, he has apologized to his wife, his family, and to the American people for this. He has taken full responsibility. This election isn’t about Donald Trump’s behavior from 11 years ago or Hillary Clinton’s recent missing emails, lies, and false statements. This election is about the Supreme Court and the justices that the next president will nominate. Evangelicals are going to have to decide which candidate they trust to nominate men and women to the court who will defend the constitution and support religious freedoms. My prayer is that Christians will not be deceived by the liberal media about what is at stake for future generations. I understand Graham’s reasoning. He’s pro-life and pro-Constitution. But as a pastor, I shouldn’t have to remind him that the voting for the lesser of two evils is still evil. Moral equivalency is something the Bible strongly stands against. As a Christian, and a devout one at that, Graham knows this. Yes, it is certain if Clinton is elected, she will destroy everything. Trump’s supporters say that there is a chance he’ll do the right thing. Since when is this how we vote and why did we let it get to the point that our best option was to roll the dice with a man who doesn’t know how to tell the truth? How do you square that with God? Is it so easy to just ditch your Christian principles and character for a movement? To support either side here, in my view, is a grave sin. I expected better from Franklin Graham. Once again, I feel disillusioned when looking at those I considered to be of moral and good character. Most have succumbed to voting for the right lizard here.